Yesterday’s afternoon, the 30th of October at the Nieuwe Instituut Rotterdam we listened to Prof.Dr. 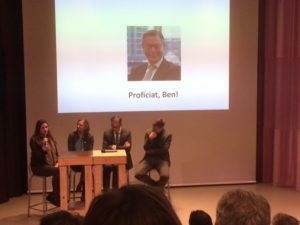 Ben van Lier who delivered his inaugural lecture for the Hogeschool Rotterdam; ‘Thinking about ecologies of autonomous cyber-physical systems and their ethics’. Afterwards a (too brief) discussion moderated by Rob van Kranenburg (Council) with Liisa Janssens (TNO), Linda Kool (Rathenau) and Jonne Hoek (TU-Twente). Again the conclusion was drawn that the overall lack of awareness is real; the english text of the lecture is published by the HR but should in fact be transformed into a summary in Dutch and published widely.